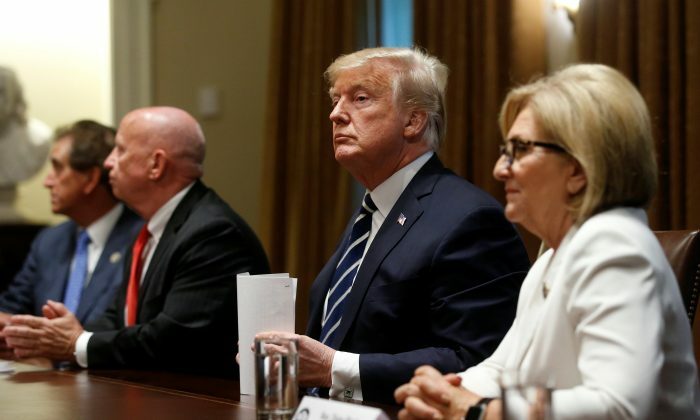 President Donald Trump reaffirmed his support for America’s intelligence agencies on July 17, amid a media firestorm following his meeting with Russian President Vladimir Putin in Helsinki. The occasion marks at least the sixth time the president has affirmed his support for the intelligence agencies’ assessment that Russia meddled in the U.S. election. The most recent instance took place at the summit with Putin. Trump said that he has “great confidence in my intelligence people” but noted that the Russian leader expressed an “extremely strong and powerful” denial of the allegations. In March this year, Trump said that “the Russians had no impact on our votes whatsoever, but certainly there was meddling.” In November last year, Trump said, “I’m with our agencies” on Russian election meddling. And in January and July 2017, he said, “I think it was Russia” that meddled in the election. Despite the multiple affirmations of his faith in the intelligence agencies, major media outlets seized on a single word from Trump’s response to a question at the summit in Helsinki in order to advance a narrative that Trump didn’t stand up for America. The president said that he thought he had made himself clear at the summit, but, upon seeing the media backlash while on his way back to Washington, he decided to review the transcript and the video of the press conference. He discovered that one word in his comments on Russia was not what he meant to say. “The sentence should have been ‘I don’t see any reason why it wouldn’t be Russia,'” Trump said on July 17, correcting the word “would” to “wouldn’t” from his statement from the day before. Trump pointed out that his administration is taking active steps to defend against future attempts to meddle in elections, in contrast to the Obama administration, which gave a stand-down order when informed about Russia’s meddling attempts before the 2016 election. In May last year, Trump signed an executive order directing the government to strengthen and review the cybersecurity of the U.S. government and critical infrastructure, according to the White House. The Department of Homeland Security is leading the effort to improve election security. The agency is helping 34 states and 52 local and county governments by conducting cybersecurity on an ongoing basis. DHS has also conducted on-site vulnerability assessments in 16 states by request. In addition to protecting against election meddling, the White House has also punished Russia via a series of sanctions and expulsions since last year. The administration sanctioned Russian individuals and entities in February, April, and June this year, according to the White House. These measures were on top of sanctions and trade controls issued in 2017. In March last year, the White House sanctioned several Russian individuals and entities for hacking and election interference. That month, Trump ordered the expulsion of 60 Russian intelligence officers from the United States. The administration has also sanctioned a total of 100 individuals and entities in response to Moscow’s occupation of Eastern Ukraine and Crimea, and several others for violating the Iran and North Korea sanction regimes. Trump is also garnering support from America’s allies to deter Russia’s geopolitical ambitions. The president said that he had convinced NATO allies to spend billions more on defense. The president’s administration has also “increased funding for the European Deterrence Initiative, providing billions to increase United States troop readiness in Europe, deter Russian aggression, and help defend our NATO allies,” the White House said in a statement.